Truck buyers have a variety of solid options within the class, but those looking for a beefed-up truck with lots of power under the hood and plenty of standard features will want to keep an eye on the 2017 Nissan Titan, which is back after a brief one-year hiatus. Wondering how the 2017 Titan compares to tough competitors in its segment? 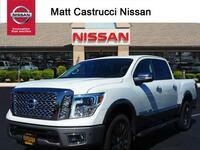 That's why you have our team here at Matt Castrucci Nissan! We never want you to feel overwhelmed during your car shopping journey, so we're putting the 2017 Titan head-to-head against one of its most popular competitors: The 2017 Chevy Silverado. Both big trucks come with a variety of cab configurations and bed lengths, but what are the key differences between the two? Read on to find out! 5.6L V8: 390 hp; 394 lb.-ft. Engine Specifications 4.3L V6; 285 hp; 305 lb.-ft. The 2017 Chevy Silverado comes in eight number of trim levels, leaving truck shoppers overwhelmed. Trim levels include Custom, WT, LS, LT, LT Z71, LTZ, LTZ Z71, and High Country. But it doesn't even end there. Truck shoppers will also need to choose a cab configuration, box length, drive train, and engine once the trim level has been chosen. It terms of how the 2017 Silverado compares to the 2017 Nissan Titan, the 2017 Titan is more capable and more equipped on almost all fronts. In fact, the 2017 Titan's engine is not only larger than the Silverado's, but it's more powerful as well. Additionally, the 2017 Silverado is missing features such as power windows, a panic alarm, an exterior thermometer, a rear defroster, Bluetooth connectivity, steering wheel audio controls, an MP3 decoder, a CD player, Push Button Start, and a keyfob, all of which come standard on the S trim of the 2017 Titan. The 2017 Nissan Frontier comes in five trim levels: S, SV, PRO-4X®, SL, and Platinum Reserve. Truck shoppers are able to choose between a variety of cab configurations for each trim, including Single Cab, Crew Cab, and King Cab®. All trims come equipped with a powerful 5.6-liter Endurance® V8 engine that kicks out an impressive 390 horsepower and 394 pound-feet of torque. Yes, you read that right. Even the base trim comes equipped with that monster, which means you don't need to pay extra for the performance you're looking for. The 2017 Titan also comes with America's Best Truck Warranty, offering 5 years and 100,000 miles of bumper-to-bumper protection, whereas the 2017 Silverado is only protected for 3 years or 36,000 miles. 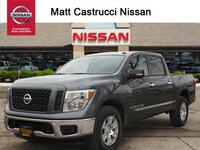 Truck shoppers interested in learning more about the impressive 2017 Nissan Titan are encouraged to contact a member of our team at Matt Castrucci Nissan today!